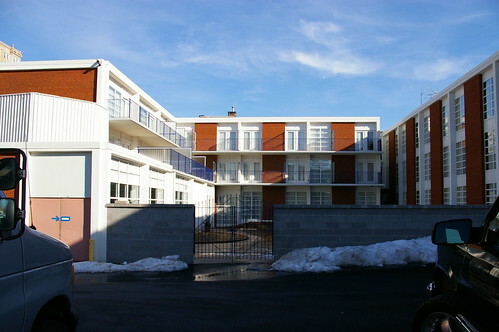 On May 1, the National Park Service listed a mid-century motel on Lindell Boulevard in the National Register of Historic Places. 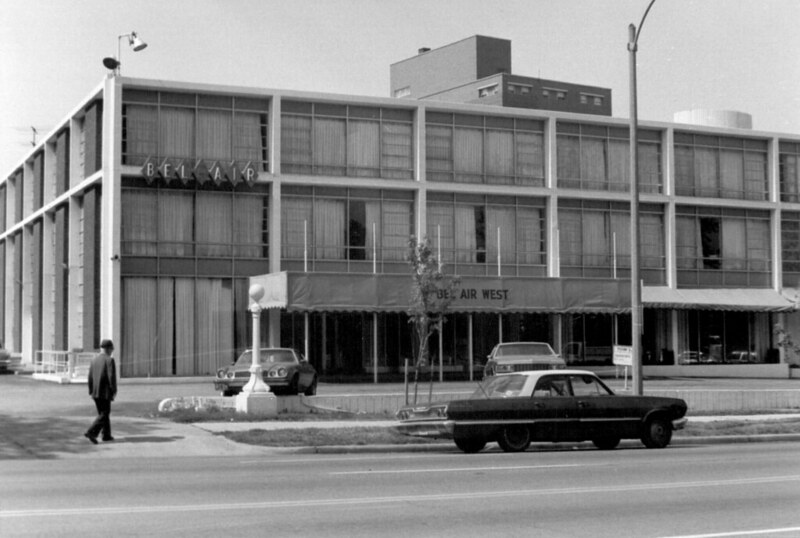 This recognition went not to the much-celebrated, threatened DeVille Motor Hotel, but to its predecessor one block west, the former Bel Air Motel at 4630 Lindell Boulevard. 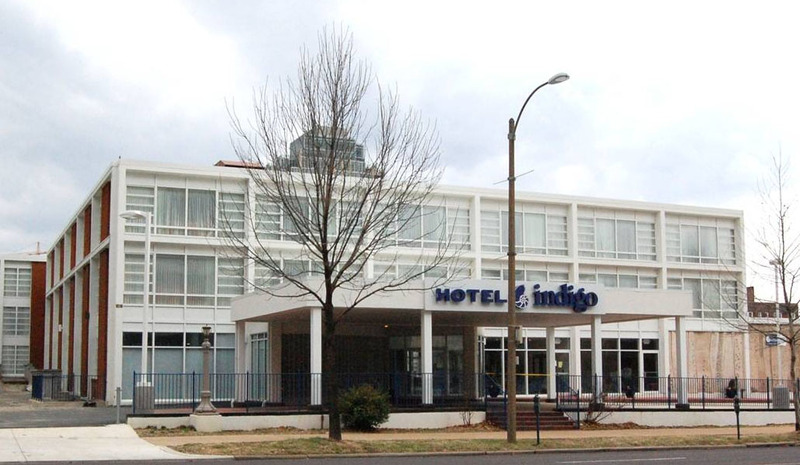 Along with the National Register listing, the Bel Air has received a $9 million renovation by the Roberts Companies and rebranding as the Hotel Indigo. 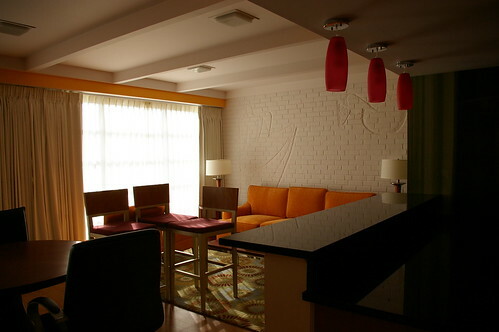 Although not yet open, the spiffed-up modern motel has attracted a lot of positive attention. Central West End residents can’t believe their eyes when they look at what was recently a run-down Best Western. Others have taken notice, too: last month, Landmarks Association of St. Louis bestowed upon the Roberts brothers one of the Most Enhanced Sites awards, further recognizing the mid-century renovation. The motel’s streamline frame has been cleaned and repainted a crisp white (the previous colors were black and pink), the obnoxious canopy rebuilt in a manner sympathetic with the motel’s design and the interior updated. All in all, the Hotel Indigo is a shining, clean, cool testament to the power of imagination and rehabilitation. The place hasn’t looked this great since opening day in 1958! That opening day was a big event itself, since the Bel Air was the city’s first motel. The motel (short for “motor hotel”) style of lodging dated back to California in 1925. Motels before World War II tended to be “motor courts” like the celebrated Coral Court where rooms had separate exterior entrances and often private garages facing out on a court or central driveway. In St. Louis, a few of these courts were built in St. Louis County and in Illinois on Route 66. 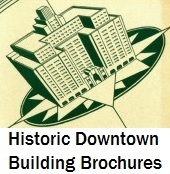 The city had its large, fine hotels with lodging, dinner and dancing all under one roof. Over the years, the motel’s luster was lost through changes in ownership, interior decoration and exterior painting and signage. The Bel Air lost more of its historic character than the DeVille Motor Hotel has, yet it retained more than enough beauty to attract the interest of a developer and get listed in the National Register of Historic Places. The Roberts Companies purchased the motel in 2007 and worked with Killeen Studio Architects to develop a thoughtful, respectful rehabilitation plan. Karen Bode Baxter, Tim Maloney and I wrote the National Register of Historic Places nomination. The renewed Bel Air Motel shows us that mid-century motels can be rehabilitated beautifully and that developers are interested in tackling these buildings. While many of the city’s modern motels are lost or reclad, those that are left could very well follow the path that the Roberts Companies has wonderfully shown us is possible. This entry was posted in Central West End, DeVille Motor Hotel, Historic Preservation, Mid-Century Modern, Motels. Bookmark the permalink.